Adventurers: Find a Guide, Plan and Book Your Trip Here. This is a special invitation to guides offering services of noodling for catfish. ...and for those people looking for a handfishing guide to book a trip with. Do you, or somebody you know, have catfish noodling expertise and would like to offer services as a guide? Great! We invite you to post your catfishing guide service information here for FREE! That's right, no advertising charges what so ever. 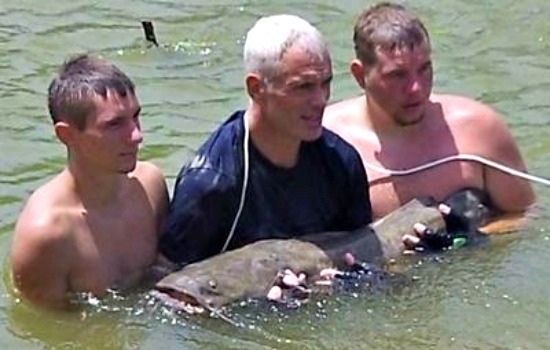 River Monster's host Jeremy Wade and Adrenaline Rush Noodling with a big catfish. This section is primarily focused on guides and their services. However, you can find out more about this crazy sport by visiting our catfish noodling page. Guide Search - If you're searching for a guide to book a trip with, scroll down this page until you see the list of them below the header that reads "Catfish Noodling Guides". Catfish Noodler Guides - Continue reading to submit your services for a free listing. Why are we offering this free invitation to you? It seems that a good catfish noodling guide is hard to find. I have been contacted on multiple occasions by people looking for recommended resources of experienced fishermen to take them handfishing for catfish. Unfortunately, I have not been able to provide them with any personal contacts to accompany them on a handfishing trip (until now). Upon my research, I had seen many other inquiries around the internet about people looking for information about where they can find a guide to take them out hand grabbling for catfish. I've seen questions posted on various fishing websites, forums and blogs. However, most of those questions don't even have any responses. So, it's obvious that hundreds of people are looking to go noodling for catfish, and you provide your services as a fishing guide, yet nobody knows about you because they can't find you. And that's where I plan to help. Why else submit your guide service information here? This freshwater fishing website receives thousands of visitors each month. And there are hundreds of people interested in catfish noodling. Therefore, you include your business information here to be exposed to those people. They see it. They contact you. You take them handfishing. You get paid. They're happy. You're happy. And I'm happy. It's a win-win-win for everybody. Submitting your catfishing guide and service information is easy. The goal is to attract customers' attention to you, and to make them feel comfortable and confident that they can trust you. So, allow for your audience to be aware of what they might expect to experience out in the water with you. People enjoy pictures too. To add even more attraction, you can upload a photo (up to 4) to show what you're capable of catching and the excitement of other catfish noodlers, and/or your logo if you have one. Are you a catfish noodling guide? Great! Submit your services here. Follow the recommended structure laid out for you above in the submission guidelines, or compose it the way you wish to. Your catfishing guide services will appear on a Web page exactly the way you enter it here. You can wrap a word in square brackets to make it appear bold. For example [my story] would show as my story on the Web page containing your story. Do you have some pictures, graphics or a logo to add? Sweet! Click the button and find the first one on your computer. Select it and click on the button to choose it. Okie Noodler Champion Skipper Bivins from Oklahoma. Check for pricing and booking information here. Check out Marty Jenkins and his catfish grabblers here in Tennessee to see if they're booking. As you plan your trip, there are a few things to think about before you finalize your decisions as you research. Handfishing isn't legal everywhere. The following is a list of states in Northern America where noodling is legal. If there is a state that should be included or should not be listed above, please contact me so that I can include/delete it on the list. Note: The laws and regulations may be subject to change. Be sure to double check with your local department of fish and game if you decide to set out on your own handfishing adventure. Feel free to leave a comment or question below if you're a facebook user. Or check out our catfish noodling questions and answers section.